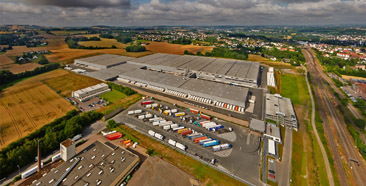 The logistics center in the Westphalian town of Löhne, which opened in 2016, has 100,000 m² of indoor space and is one of the largest logistics centers in North Rhine-Westphalia. 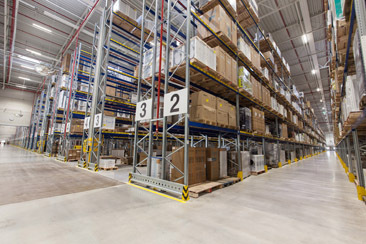 The state-of-the-art facility specializes in the logistical handling of furniture and large electrical appliances. The special feature: For the first time, warehousing and goods handling are concentrated under one roof in a logistics center for large parts. And that also benefits the environment, because by combining storage and HUB, we save around 300 tonnes of CO2 each year. The combination of warehouses - operated by Hermes Fulfillment - and HUB - operated by the Hermes Einrichtungs Services makes it possible to offer dealers an even better service in 2 - man handling because the internal processes are accelerated. The entire process from goods receipt to goods issue runs more efficiently. In addition to warehousing and order picking, our range of services also includes returns management, the processing of returned items and the repair of technical equipment. 20,000 m² of space are available for this, in which Hermes Fulfillment checks and stores the items sent back by the customers. Every day, around 245 trucks with up to 30,000 large items such as sofas, washing machines and flat-screen televisions are loaded and distributed to more than 60 Hermes sites in Germany, the Netherlands, Switzerland and Austria for end-customer delivery. And to cope with all this, we currently employ about 1,000 people, making us one of the largest employers in Löhne. The second location of our HUB is located in Mosina / Poland, near Poznań, the center of the Polish furniture industry. In cooperation with the company Anton Röhr Logistyka, around 600,000m³ of modular and upholstered furniture are handled in Mosina every year for the Hermes Einrichtungs Service. The goods delivered in the HUB are bundled and forwarded daily to the Hermes depots for delivery to the end-customer. The running time between the goods issue and the delivery to the customer is reduced to an average of 7 days. At the same time, with improved flexibility and transparency, significant transport costs can be saved. In addition to the receipt of goods and incoming goods inspection, Röhr also undertakes picking and consignment consolidation as well as quality control of the goods.